We hope you are enjoying your summer break so far, and especially lately, that you are finding ways to stay cool! For the remainder of the summer, be sure to check in weekly as we will cover some “introduction to” topics, designed for those who are new to Montessori or have children entering a Primary classroom this coming fall. 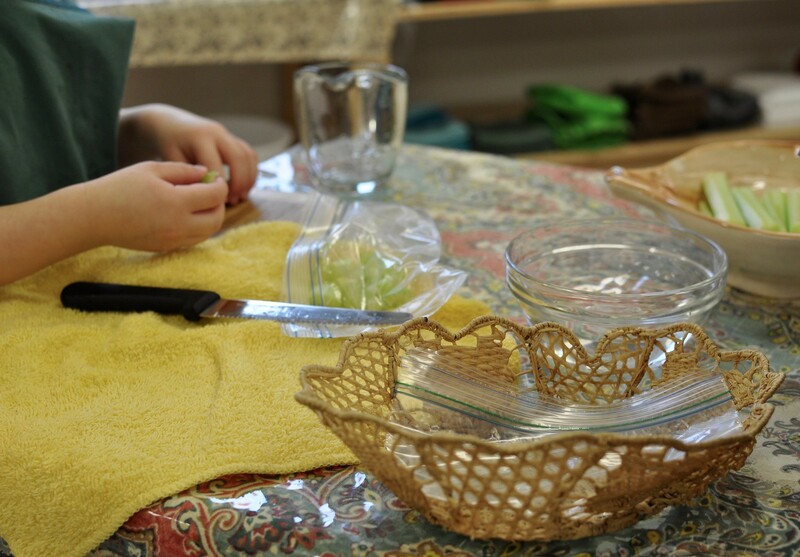 Today, we discuss an introduction to practical life in the primary classroom. 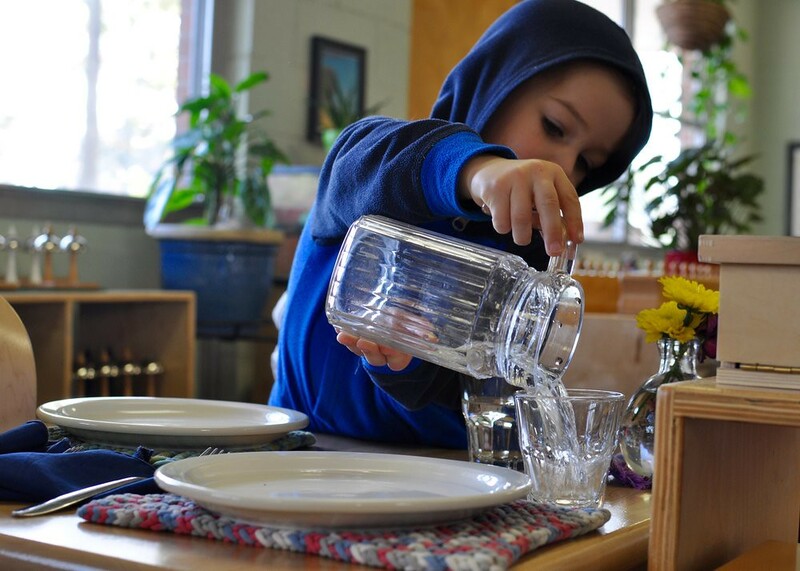 When the smallest child enters a primary classroom for the first time, he will be introduced to the practical life area of the prepared environment before other lessons. 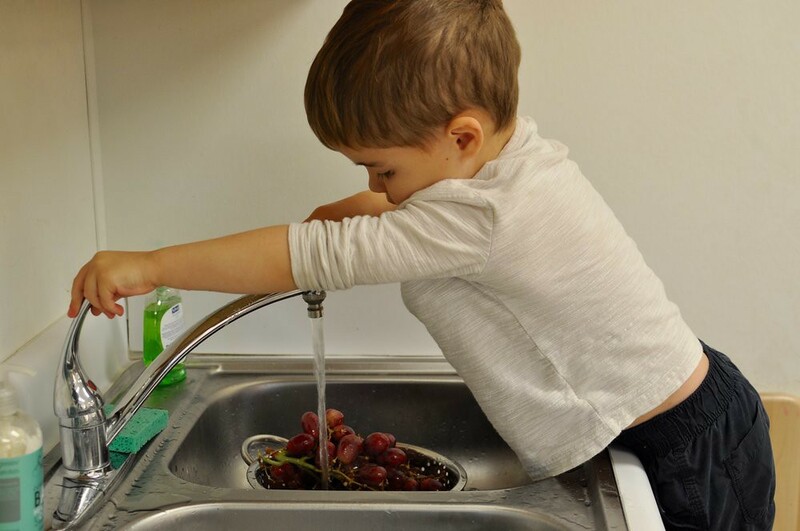 The practical life exercises are comforting to a child, as they are familiar and relatable; these are the objects and work they have seen at home but may not have had the opportunity to participate in just yet. 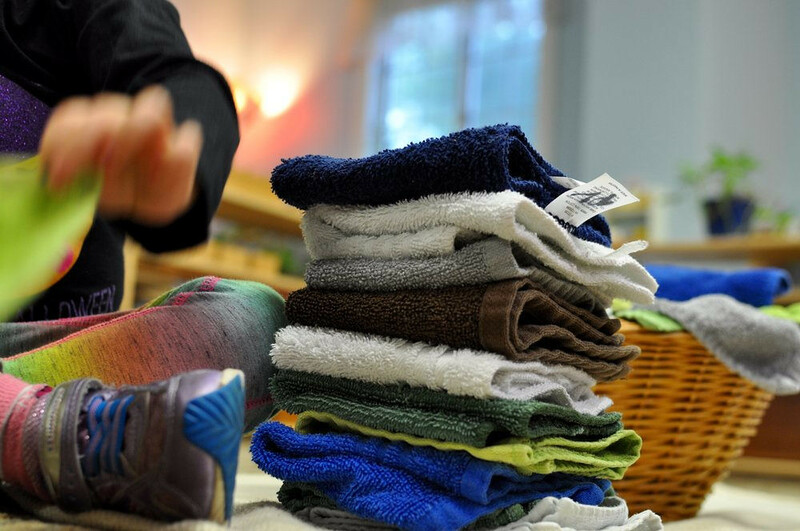 There are also many differences between the home environment and the prepared school environment, such as the use of old fashioned mechanisms (like the washing board and basin) instead of newer technology (like a washing machine). These exercises are motives for activity. In other words, they are exercises that are preliminary, and show a child how to do things without holding real purpose in and of themselves. Instead, these activities prepare the child for more complex lessons to come, while helping a child acquire the coordination needed for more complex work. These preliminary exercises build upon a child’s control of movement, attention span, concentration, and self-control. All of the practical life lessons tune in to a child of this age and his need and desire for movement. A child of this developmental stage has an urge to refine movement, and is thus attracted to it. Later, these activities are undertaken for different reasons – namely, the knowledge that this work needs to be done for the good of the group. 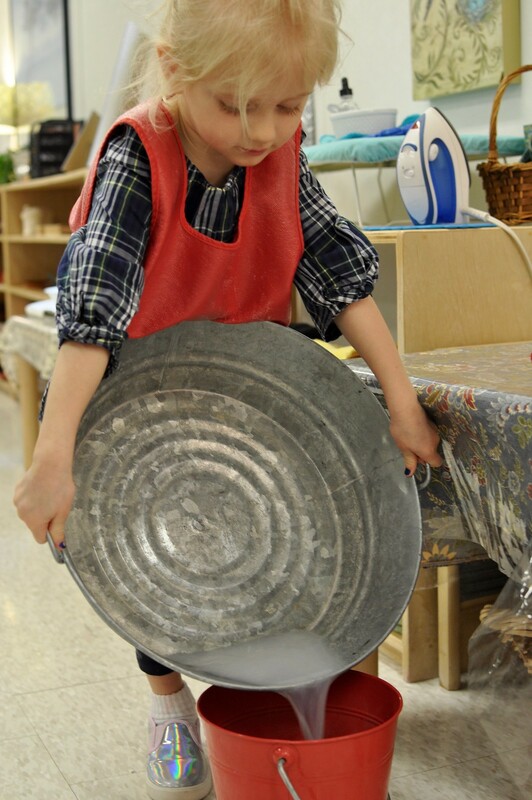 First activities, such as carrying a tray, opening a door, rolling a rug, or walking around a mat, draw attention to a child’s body movements. 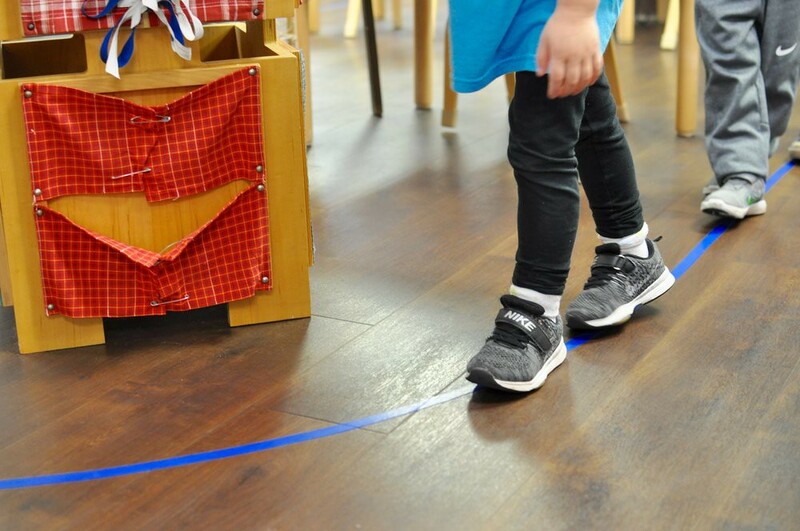 These activities, which seem simple to us, provide a child with precise and helpful feedback, guiding him to perfect his movements at just the time when he is inclined to do so. There are two lessons that provide no other purpose than for movement itself: walking the line and the silence game. During walking the line, control and coordination of the body is met with grace, balance, and poise. In Primary Guide Jessie Braud’s class, walking the line is accompanied by soft classical music. 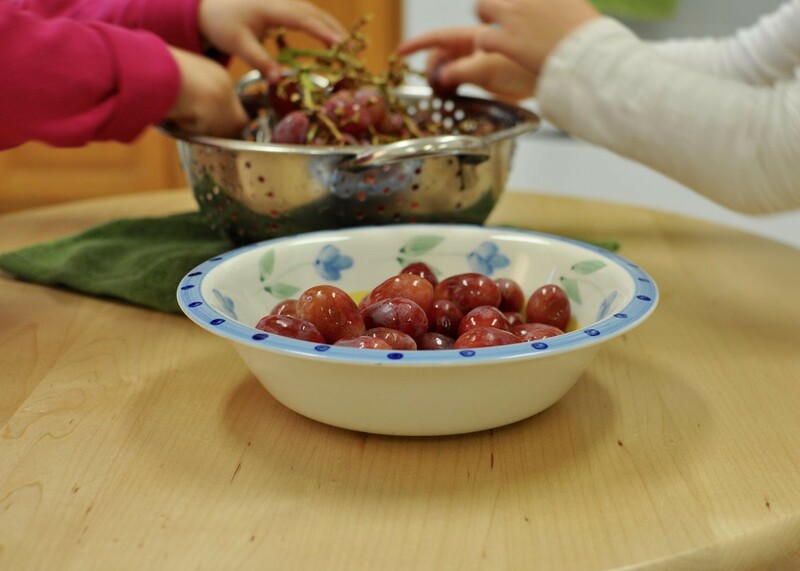 It is used in transition periods and works wonders to coordinate quiet concentration amidst a larger group of young children, signaling a class-wide shift. Exercises of practical life also include lessons on grace and courtesy: how to cover your mouth when you sneeze, how to pass in front of another child, how to knock on a door and wait for someone to open it, how to greet others, how to introduce someone. Emphasis is always placed on the personal dignity of the child and the respect of individual rights. Through work in practical life, a child learns to adapt to her new community.